Japan's ¥162.7 trillion ($1.5 trillion) Government Pension Investment Fund on Monday announced key details of the performance-based fee arrangements being introduced this year, including the formula used to reward equity and bond managers for alpha and its mechanism for taking underperformance into account. A working paper posted on GPIF's website hewed closely to the broad tenets top pension fund executives have outlined previously, which aim to ensure managers only get active fees if they outperform their benchmarks, and passive fees if they don't. The paper said under GPIF's "current fixed-fee structure and partial performance-based fee structure, asset managers are paid considerable sums regardless of their investment performance," with little incentive to appropriately set the excess-return targets GPIF demands of each manager. 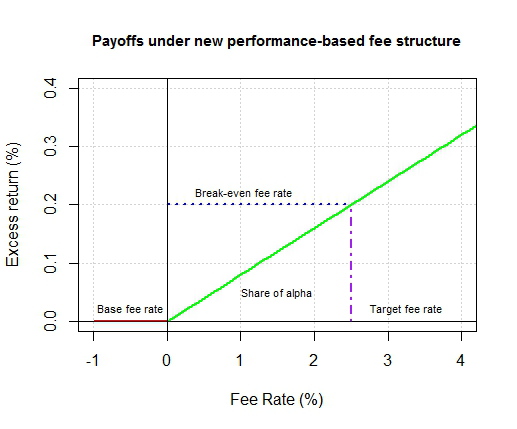 Those "target-excess return rates" play a key role in the formula GPIF announced Monday to determine the portion of alpha each manager will retain under the new system, along with the "break-even fee rate" — at which a manager's success in delivering that target return brings in the same level of fees earned under the old fixed-fee arrangements. The formula for the "value-sharing rate" is: (break-even fee rate minus passive-base fee rate) divided by (target-excess return rate minus passive-base fee rate). By way of example, if a manager's previous contract with the GPIF had entailed a 20-basis-point fixed fee and a target return of 250 basis points above the benchmark, and the fee for passively managing the same mandate was 2 basis points, the formula would result in the manager retaining just more than 7% of the alpha achieved. A GPIF spokeswoman conceded that the formula gives managers an incentive to set their target-excess return rates "as low as possible" to retain a higher share of the value they produce. Doing so, however, will make it more difficult for GPIF to select those managers, she said. The target-excess return rates are ultimately negotiated between GPIF and the managers. The working paper also outlined the new system's "carryover mechanism" for ensuring managers make up for losses incurred along the way before netting performance fees. GPIF executives had previously suggested the new system would include clawbacks, but the working paper said that arrangement — which could force managers to pay taxes on fees that couldn't be recognized as revenues for accounting purposes — would have proven too financial disadvantageous for managers. Instead, GPIF outlined a mechanism where 45% of the alpha a manager produces for a given year will count toward that year's compensation while 55% will be carried over to the next year. That 55% share of the previous year's alpha, plus any additional alpha for the new year, will be combined, and once again 45% will be awarded the manager and 55% will be carried over to the following year. If, instead, the manager underperforms its benchmark in the second year over and above the previous year's 55% carryover, the manager will only earn a passive fee that year and any net losses will be carried over in full to the next year. If a manager's contract comes to an end with an outstanding debit, the manager won't have to repay the difference, the spokeswoman said. Some money managers said the new system would prove challenging for them. "Revenues are going to drop significantly this year" for GPIF's active managers, said an executive at one of the pension fund's roster of more than 50 active managers, who declined to be named. For all of those managers, their profit and loss statements are "not going to look healthy," he said.